Bradford has a well earned reputation for some of the finest Asian food in the UK. Bradford has been crowned Curry Captial of Britain for five years in a row, the only city to have ever done it! So while you are visiting you can experience an authentic curry in one of our many restaurants. Whether you are looking for an informal cafe style favourite like the International, or high class dining at the world famous Mumtaz there will be something for you and your budget! Please note many of Bradford’s Asian restaurants do not serve alcohol but some allow Bring Your Own. Please check with the individual restaurant. Use our helpful guide below split into the most popular areas for Asian restaurants in Bradford district. Or simply browse all the restaurants. 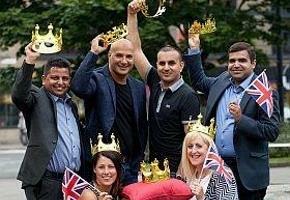 The fantastic Curry Capital team Aakash, Akbars, Kiplings and Shimla Spice. Bradford - In The City! Karachi - Long-standing, informal BYOB establishment offering curry house classics. Peacock Bar - Indian bar serving authentic traditional street food. Sweet Centre - Simple diner serving authentic Kashmiri cuisine since 1964. Anam's - Modern ambience serving traditional Kasmiri cuisine. MyLahore - A modern food inspired by the rich culture of the city of Lahore. Mumtaz - A truly unique experience of high class dining steeped in the art of Kashmiri cooking. Bharat - Classic dishes from northern India served with a modern twist in a simple restaurant, plus takeaway. Classic Persian - Restaurant offers a warm and relaxed environment with the real persian taste. Akbar's - An award winning restaurant serving the highest quality food, with service which is second to none. Café de Akbar - A relaxed cafe serving Karachi style dishes alongside European dishes. Zouk Tea bar and Grill - An award winning restaurant serving Indian and Pakistan cuisine. Jinnah - Serving authentic Kashmiri cuisine alongside famous dishes from around the world. 3 Singhs - (Laisterdyke) - A truly genuine Indian experience in a pleasant and relaxing ambience with excellent service. Kipling's (Greengates) - Indian cooking in a relaxed and comfortable bistro style atmosphere. Kebabeesh (Greengates) - A family run business creating authentic food from the Punjab areas of India and Pakistan. Prashad - Drighlington. Stylish, colourful and intimate restaurant offering South Indian and Gujarati vegetarian cuisine. Aakash - Cleckheaton. East meets west at the self-proclaimed largest Indian restaurant in the world! Azeem's - Specialising in traditional, home-cooked Asian cuisine, using natural fresh ingredients. Balti House - Serving traditional Punjabi Cuisine. Balti is a traditional northern dish, this originates from the northern region of Punjab. Shimla Spice - Offering a unique taste of authentic Kashmiri cuisine, using the freshest and best quality ingredients to create food that is simply exquisite. Aagrah - The first Aagrah restaurant serves authentic award winning Kashmiri cuisine with a modern twist. Shimla Spice - Offering a unique taste of authentic Kashmiri cuisine, using the freshest and best quality ingredients. Zaara's - Family-owned Punjabi restaurant with contemporary decor, serving classic and modern dishes. Rajpoot - Indian Restaurant/takeaway, mouth-watering dishes packed full of flavour. Panache Ilkley - Combining sophistication and quality cuisine you will be served excellent Indian food in a friendly and luxurious setting. Haworth Tandoori - Authentic Cuisine, chef's take every care to create a perfect mouth-watering dish everytime! Amontola Fusion Haworth - Hot and spicy Indian dishes, try the Chef’s Specialities for the real Amontola Fusion experience.